For cyclists and triathletes, training with power is likely the most effective way to maximize results. Why? Power meters and the data they provide remove a lot of the guesswork from training by supplying precise, accurate information for accurate measurement of training intensity and load, unlike heart rate training or rate of perceived exertion (RPE) training. Even when athletes recognize that power training offers significant benefits, many of them are apprehensive about jumping into the power-training game because they’ve heard it’s complex and they aren’t sure they have the knowledge or technical skills to get the most out of it. I’d like to make it easier. Here are a few simple steps to get started with power training and how to better understand the entire power training process. The first thing your should do after you buy a new power meter is set up your head unit with some key metrics to track. I suggest setting power, heart rate, and speed to display on the screen. And then just ride, observe and record. That’s all you should do for two to four weeks. Don’t change anything about your riding or training yet. Simply observe and begin to quantify your efforts. Be sure to record all your workouts, no matter how small. It’s pretty simple to automate the recording and uploading process, and these records will become your data diary and will be highly useful in the future. This first step gives you time to get a feeling for the relationship between power and effort, along with a basic understanding of the quantification of training. If you went up a short hill, did it feel hard? Your power meter now gives a number for “hard.” Hard for you might be 450 watts or 600 watts. Soft pedal down the other side of the hill and watch how many watts that generates. 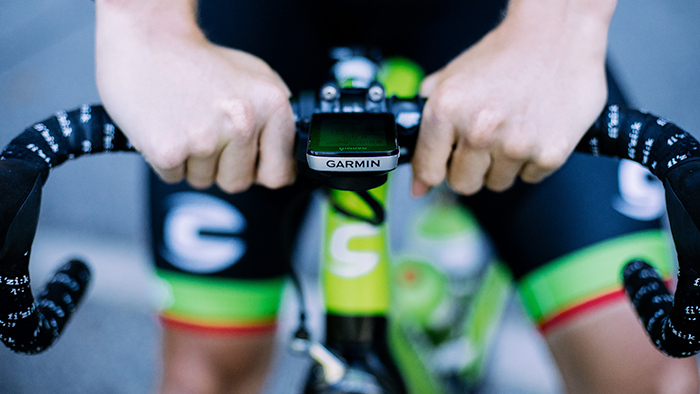 Once you’ve ridden with your power meter for a few weeks, the next step is testing. Power training focuses a lot on FTP testing, but it’s also important (especially when starting out) to test a range of targets that align with different areas of your physiology. five-second max: This test gives us an idea of your Neuromuscular (sprint) Power. one-minute test: This tests your Anaerobic Capacity (AC), which is how hard and how long you can go over threshold without resting. five-minute test: This test gives insight into your VO2max, which is the maximal amount of oxygen your body can transport and absorb (your “maximal aerobic capacity”). 20-minute test: This provides an estimate of your Functional threshold Power (FTP), which is the highest power you can maintain in a quasi-steady state without fatiguing. To estimate your FTP, use 95 percent of your average power for the 20-minute test. As you become more familiar with power training in the future, I suggest you complete a full 40km race-pace test. Day 1: Complete a good warm-up of 15 to 30 minutes, with a few one-minute, fast pedaling efforts to wake everything up. Once you’re warm, complete two x 10-second maximal sprints (we will use the peak five seconds from the sprint). This is best done in the small chainring and mid-cassette gear, so maybe 39-16 or 36-14. Rest for a full five to seven minutes between sprint efforts. Once you complete these efforts, ride casually for 10 to 15 minutes, then find a slight hill with no interruption and complete a maximum effort one-minute test. Go as hard as you can from the start and push all the way to one full minute. Finish up with a cool-down period of 10 to 15 minutes of easy riding. Day 2: Complete a good warm-up of 15 to 30 minutes with a few one-minute fast pedaling efforts to wake everything up. Once you’re fully warmed up, find a slight hill with no interruption and do a maximal five-minute test, starting hard, but not too hard. Once this effort is done, recover by riding 15 minutes of easy pedaling, then start your 20-minute maximal test. Terrain is a challenge for most of us, but try to find a road (preferably a climb) that allows you to go hard for 20 minutes with minimal interruptions. Don’t start too hard, and pace yourself. Cool down for 10 to 15 minutes when done. Once both days of testing are done, load all your data into your TrainingPeaks account for analysis. Each athlete is unique and therefore generates a unique power profile. Your personal power profile gives insight into your training needs by identifying your comparative strengths and limiters. Take a look at the Power Profile Chart in your TrainingPeaks account to see areas where you compare better or worse against the database of riders. This comparison gives insight into your strengths and limiters, revealing potential areas of training focus. The old adage “Train your weakness, race your strengths” is a pretty good place to start as you begin to think about training to improve your performance. For an even more detailed power profile, use TrainingPeaks’ WKO4 software to review your entire power-duration curve. Once you’ve estimated your FTP as 95 percent of your 20-minute maximal test, you can set your training levels in TrainingPeaks. Log into your account, click on your name, select Settings, click “Zones” at the left, and scroll down to Power. In the auto calculation section, choose Threshold Power in the first dropdown and Andy Coggan (6) in the second, and then click “Calculate.” Your new training zones are set up and targeted. Make sure you save the changes before you close the window. Dr. Andrew Coggan designed a set of training zones (or levels) to identify different areas of an athlete’s physiology, allowing us to plan specific time and intensity into workouts to gain the improvements we want in those specific physiological demands. These zones are now referred to as the Coggan Classic Zones. Take a look the diagram below and notice the relationship between intensity and time. For most people starting out with power, it takes a bit of trial and error to figure this out, but efficient training is all about the right intensity for the right length of time. Now that you have power data and a power profile, you already have a good idea of your ability as a rider and how you compare to the world, so you can move on to consider the demands of your event. Each event has unique demands, as you can imagine; there’s a dramatically different demand for a road race compared to an IRONMAN, and each one needs a specific training plan for success. Ability of the rider: A simple starting point is to use your power profile and focus on your limiters. At the core off all good training is the development of your aerobic engine, but adding two to four days of limiter focus in each training microcycle (typically 21 to 28 days) can really help you improve. Demands of the event: This is easier than you think! Do your research first and know the details of the event. How long is it? What’s the terrain like? Are there any big climbs? What are the technical demands? The answers to these questions and any additional data you can find will help you plan your training. If your big event features a steady climb that typically takes about 15 minutes, you need to make sure you’re doing workouts to improve your steady-state climbing for that time range. Similarly, if your event includes a series of rolling power climbs, build your training to prepare you to power over those climbs. TrainingPeaks.com has an excellent Annual Training Plan feature that is a great tool to use if you chose to create your own plan. Track all your data and review it at least once per week. Look for insights such as improving numbers, better performance and/or decline. Learn to cross reference your data in areas of training load and performance; this will add deeper insight into how your training is affecting your performance. Testing is one of the most important things for an athlete new to power. I recommend that you repeat the test protocol every four to six weeks and track your results. If you’re training correctly, you should see improvements, specifically in the targeted areas. These steps are a simple outline of the process and should be a great roadmap for any beginner. I recommend that you read Training and Racing with a Power Meter by Dr. Andy Coggan and Hunter Allen, as well as Joe Friel’s The Power Meter Handbook. If you’re interested in digging even deeper into power training knowledge, TrainingPeaks offers a full online education and certification program that teaches both the fundamentals and some advanced techniques of power training. Interested in learning more about WKO4 software? Download your free 14-day trial here.